One of The Larget oil Company in Nigeria called Mamador's Nigeria is now giving out lots of goodies for you to win and the grand prize for 3 lucky winners? 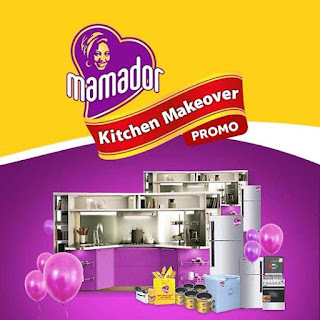 In the new Promo Called Mamador Kitchen Makeover. According to Mamador's on its official Facebook page, The company says In This new Makeover Promo, There are many opportunities to win airtime and thousands of kitchen appliances and more. Here's how you can enter and be in with the chance of winning the kitchen makeover and other fantastic prizes. Now Quickly Scratch the panel to reveal the unique pin and send the PIN to 20822 in this format: Mamador <Space> Unique PIN. Any Valid PIN gives both free Airtime and stars. The stars Only qualify you for the Monthly E-raffle Draw which takes place at the end of 30days Cycle. The Text Message will cost N10 and you'll get an auto response informing you on your instant Prize. You must Earn a minimum of 6stars per Month on the same number which is Equivalent to one entry in order to participate in the monthly E-raffle draw. 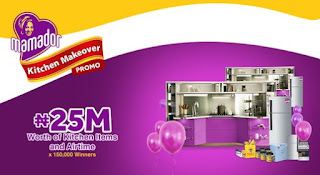 Where you stand a chance of winning one of 3Kitchen Makeovers and Kitchen Items Worth Of 25M in 3months.